To prevent getting H1N1, health officials continue to urge vaccination. ATLANTA, Georgia (CNN) -- As the new H1N1 flu virus keeps spreading, more vaccine is available to fight it, the director of the Centers for Disease Control and Prevention said Friday. Forty-eight states are reporting widespread flu activity, two more than a week ago, Dr. Thomas R. Frieden said at the CDC's weekly briefing. There have been 114 pediatric deaths since April, when the H1N1 virus first emerged, with 19 reported to the CDC in the past week, he said. Frieden also told reporters on Friday that in the past two months, more people younger than 65 have been hospitalized than would be expected in a full season of more common strains of flu. He urged people with underlying illnesses who exhibit flu symptoms to seek medical attention promptly, saying that only half of the people in this high-risk group appear to be doing so. To prevent getting H1N1, health officials continue to urge vaccination, and that might be becoming easier, Frieden said. "We have more vaccine," he told reporters Friday -- 26.6 million doses are now available in the United States, up more than 10 million doses from a week ago. The CDC had hoped to have 40 million doses of vaccine by the end of October, but vaccine-manufacturing delays forced them to revise that number down to 28 million. Earlier Friday, the latest recommendations from the Strategic Advisory Group of Experts on Immunization (SAGE) were discussed by Dr. Marie-Paule Kieny, director of the Initiative for Vaccine Research at the World Health Organization. The experts met Wednesday to review the current status of the H1N1 pandemic vaccines, including the results of clinical trials. SAGE has concluded that one dose of H1N1 vaccine is sufficient for children older than 10, the vaccine is safe for pregnant women, and it can often be given at the same time as seasonal vaccines, said Kieny, speaking to reporters via teleconference from Geneva, Switzerland. Doctors have found there is an immune response to the vaccine in children as young as 6 months. More clinical trials are being done on children ages 6 months to 10 years and on people with immune deficiency disorders, Kieny said. She noted that in September, the European Medicines Agency (EMEA) recommended that children receive two doses of the H1N1 vaccine, as has the CDC in Atlanta, Georgia. However, the EMEA also acknowledged that one dose may be sufficient, if a child has received a flu vaccine before. Some countries may opt to give one shot in order to vaccinate more people, and that is their option, Kieny said. Nations also have a right to choose which company to use to supply the vaccine. Not every country is getting the same vaccine. The virus for the vaccine distributed in the United States is grown in chicken eggs. Some vaccine licensed in Europe has been manufactured using a new cell-based technology. Also, in some countries the vaccine has an added booster called an "adjuvant" to amplify the vaccine's ability to produce antibodies. Other countries, like the United States, are using non-adjuvanted vaccine. This makes a difference in how the vaccine works and how many doses may be necessary. As a result, countries may have different guidelines. 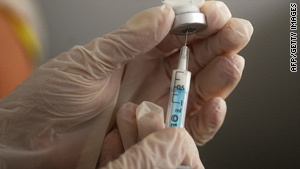 Trials involving several thousand pregnant women are showing that the safety of the H1N1 vaccine is similar to that of the seasonal vaccine, Kieny said. Pregnant women should be vaccinated because they are at "significantly higher risk for infection," especially in their second and third trimesters, she noted. WHO is donating vaccine to countries unable to buy enough. She said the goal is to distribute 200 million doses, which should allow 95 percent of the eligible nations to vaccinate at least 10 percent of their population.